New Delhi: Imitation they say is the highest form of flattery. Congress does not think so. And BJP is seething. A war of words has broken out between the two archrivals over a Congress advertisement, which appeared on Friday. The poster saying “Main nahin hum” shows Congress icon Rahul Gandhi flanked by common Indians from all strata of society and community. The poster gives a signal that the Congress led by Rahul Gandhi has put Indians, particularly common men from all section of society and communities above everything. Saffronites, however, are up in arms. They claimed that the Congress has “brazenly and blatantly” lifted the slogan, which was coined by its Prime Ministerial candidate, Narendra Modi. 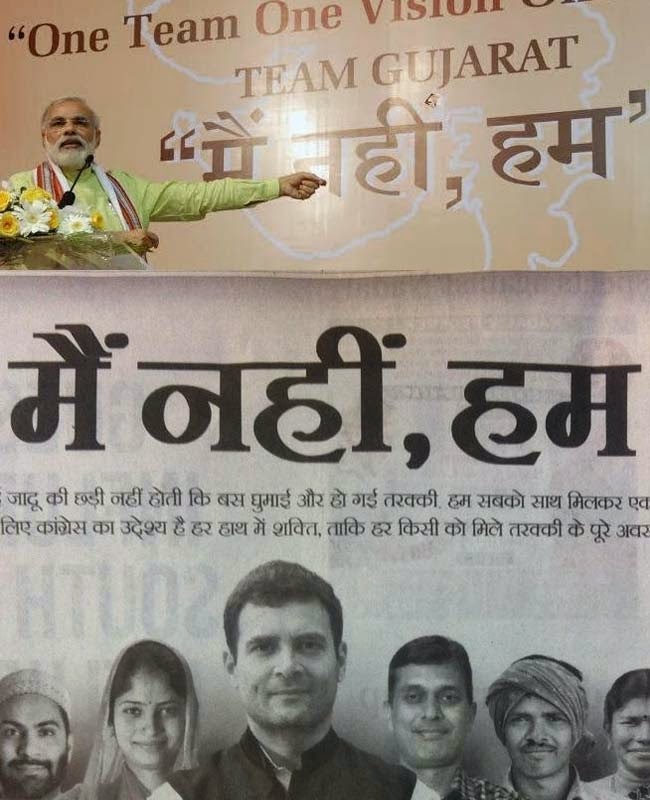 For BJP nearly two years back Modi had come up with a slogan saying - “main nahin hum” at an annual chintan shivir organised by the Gujarat government. For the BJP, the Congress‘Copy Cat’ which “is devoid policy and strategy” was not being able to even ape in a dignified manner.